Zahara Mkutukane is a born again Christian who comes from the rural areas of Phumlani just out East London, Eastern Cape South Africa. This splendid and talented youthful woman is only 23 years matured, with her parents in matrimony for over 36 years. Zahara has recently released a debut album “Uloliwe” (meaning a train) which is available in music stores through out South Africa. She brings herself in line with a very powerful motto in life, “Perseverance leads to success.” Zahara have managed to bear with her youth dream up to now, “Don’t ever let anyone tell you that, that dream is unreachable because it is!” advices the poetic lady. What makes me go all out and support her is the flair and joy that her voice brings to ones bothered and happy soul. Her music bears a very powerful emotional element, which is what I call “healing effect” that draws you close to conquering your problems. 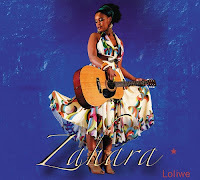 Her wholesome album offering “Uloliwe” have been well received by the music industry, media and her fans. The album so far sold more than 110 000 copies in 21 days, which proves to a greater length that when something is of high standards it is difficult to pirate. The title song of the album “Uloliwe” is amongst the first songs that have been enjoyed in South Africa dating back from the likes of Brenda Fassie who knew how to transport good music to the audience, more importantly the affected part “ear”. Her music is telling a story which is very important when one is composing music. Stories like, “Kudala bendimonela besithi andiyonto,” (They have been jealous of me, telling me I’m nothing). But thanks to TS Records for wonderful talent recognition and nurturing, and the spirit within her that helped her rise above all that. I am sure being a born again has amongst other things helped her to stay strong and battle her obstacles with the spoken word. Her debut album “Loliwe” is available in ALL MUSIC stores Nation Wide! If you don’t have a copy yet, be a go grabber. Until next time I wish her the entire lady luck in the world.